Spend hours of fun with Hasbro Game Night for the Nintendo Switch! 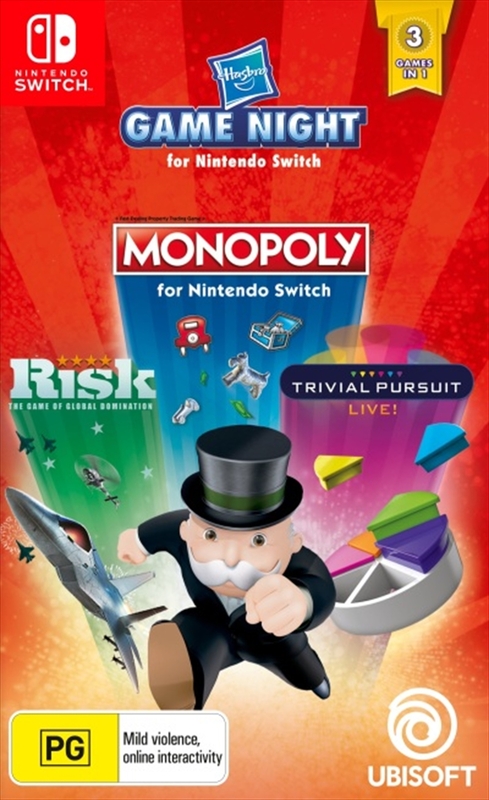 Three of your favorite Hasbro games - Monopoly for Nintendo Switch, Trivial Pursuit Live!, and RISK - are now available with a fresh twist on your Nintendo Switch system. At home or on-the-go, challenge your friends, family or online opponents from all around the world. Customizable modes, 3D visuals, and many more surprises are waiting to make your game night more fun than ever! You can now enjoy your favorite Hasbro games on Nintendo Switch, wherever and whenever you want!